NEELUM VALLEY, Jammu and Kashmir, July 27, 2012 (ENS) – A journalist has been arrested by police and is being detained after the publication of photos he took of historic trees chopped down by government officials. Elderly eyewitnesses say the trees that were cut down were 54 years old. They were planted by the hands of prominent personalities of national fame, including the first Prime Minister of Jammu and Kashmir, Abdul Hamid Khan. The photos show trees that were felled before the July 18 visit of Pakistani Prime Minister Raja Pervez Ashraf to Athmuqam in the Neelum Valley of Pakistan-administered Kashmir. Khawaja Fiaz Hussain, a correspondent for a leading Urdu daily newspaper and a freelance photojournalist, released a collection of images of the felled trees, both pines and other species. The images were widely carried by local newspapers and aroused public anger over the logging by the government workers, whom local people describe as being primarily responsible for the protection of forests and environment. In the Neelum Valley, the forests of pine fir and deodar trees provide habitat for endangered species of wildlife. The police claim that Hussain was arrested for involvement in the production of forged educational documents. 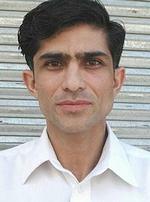 Detained in a police station in the Neelum Valley, Hussain denied the charges in a phone interview with this correspondent. “Police officers called me into the police station where I was shocked to see that I have been charged for making forged documents for school students,” said Hussain. “Earlier, police requested me to visit them because they said they wanted to question me about some community matters,” he said. “When I saw government high-ups brutally chopping the trees, I performed my professional duty to highlight this insane act,” he said. Local journalists say that police had already arrested another person on same charge but he was released when police forced him to name the journalist for involvement in the scam. A broadcaster who also filed footage of the incident to his TV channel describes this logging as illegal and unreasonable. “Trees were chopped unnecessarily by the government workers in pretense of ensuring a safe landing for the plane of the Prime Minister,” said Amiruddin Mughal, who has widely covered environmental issues of this region. “In the past U.S. humanitarian forces had used the same landing area without any intervention in local forests to provide aid to the victims of the Kashmir earthquake in October 2005. They came in Chinook helicopters, which are larger than plane of our Premier,” said Mughal. Community workers also criticize the government for carelessness and demand justice for the arrested journalist who publicized this exploitation of forests. In this disputed Kashmir region, five activists have been languishing in a jail for more than two years for advocating the plight of victims of climate change. In January 2010 a large population was displaced due to torrential rains and landslides that created Attaabad Lake in the Gilgit Baltistan region of Kashmir, an incident that is chalked up to the planet’s warming climate. Pakistan is a signatory to all the major international environmental agreements, but governments have been blamed for overlooking the significance of natural resources.